Do you Know chimps have friends? 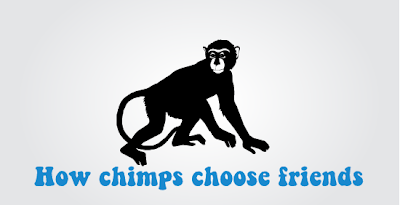 Interesting research on how chimps choose friends? Like humans, many animals have close and stable friendships. However, until now, it has been unclear what makes particular individuals bond. Cognitive biologists at Austria’s University of Vienna and Switzerland’s University of Zurich found that chimpanzees choose friends who are of similar personality. The results of this study appear in the scientific journal Evolution and Human Behaviour. Chimpanzee personality in two zoos was measured with behavioral experiments and years of observations of chimpanzee behavior. Which came first: dexterous hand or agile foot? Resolving a long-standing mystery in human evolution, new research from Japan’s RIKEN Brain Science Institute indicates that early hominids developed finger dexterity and tool use ability before the development of bipedal locomotion. Combining monkey and human behavior, brain imaging and fossil evidence, a team led by neurobiologist Atsushi Iriki has overturned the common assumption that manual dexterity evolved after the development of bipedal locomotion freed hominid hands to use fingers for tool manipulation. In the study, published in Philosophical Transactions of the Royal Society, researchers employed functional magnetic resonance imaging in humans and electrical recording from monkeys to locate brain areas responsible for touch awareness in individual fingers and toes, called somatotopic maps. With these maps, the researchers confirmed previous studies showing that single digits in the hand and foot have discrete neural locations in both humans and monkeys. Many people believe they can make up sleep lost during the workweek by sleeping more on the weekend. But can this “recovery” sleep adequately reverse the adverse effects of sleep loss? Researchers led by Alexandros Vgontzas of the Penn State University College of Medicine, placed 30 volunteers on a sleep schedule that mimicked a sleep-restricted workweek followed by a weekend with extra recovery sleep. Volunteers’ sleepiness increased significantly after sleep restriction, but returned to baseline after recovery sleep. Levels of a molecule in blood that’s a marker for the amount of inflammation present in the body increased significantly during sleep restriction, but returned to normal after recovery. Levels of a hormone that is a marker of stress didn’t change during sleep restriction, but were significantly lower after recovery. However, the volunteers’ measures on a performance test that assessed their ability to pay attention deteriorated significantly after sleep restriction and did not improve after recovery.